As it is hoped everyone now knows, the US has risen from an egalitarian country in the 1940s to 1960s, to one of the most unequal, rising steadily in inequality since around 1970. Inequality is a subject around which there is heated debate. Most agree incentives are important for motivation and for progress–we want to reward those who succeed, so that they can count on the financial motivation for their hard work and risk in doing so. I vote for that. My life is benefitted by the advances of Amazon and Google, and I love my all-electric car. The people who provide me these benefits deserve to be rewarded. But most of us do not want to see high unemployment, stagnant wages for the middle class, increased poverty, and for public services such as schools and roads to further deteriorate. We don’t want to see homelessness increasing on our streets. We certainly don’t want inequality to get worse, if there is any reasonable action we can take to prevent that. The debate has come to involve whether government has a role, or whether everything should be left to the free market. I’ve been reading Thomas Piketty’s new book Capitalism in the Twenty-First Century, now a best seller and the subject of lots of op-eds, blogs, articles, reviews, talk shows and the like. I like it and I am impressed by his scholarship and his fair and objective manner, constantly reminding his reader that his work is not perfect–nothing is in economics. Piketty provides a readable summary of years of analysis of tax records in a number of countries, along with his own forecast of the future based on history and what he finds as the factors driving inequality over time, and then makes suggestions for how to better equalize the world. So far, even the harshest critics pour abundant praise on his research and historical findings. One broad area of criticism argues that when he sets about to forecast in his second section, he’s venturing into the unknown. Arguments remind that seldom are forecasts accurate, that one really can’t know the critical variables of the future, likely different from those of the past, that forecasting is not the stuff of real economists. Essentially, economists should not forecast. I’m still looking for critics who will reveal different forecasts, thus subjecting themselves to the same criticism, but haven’t found those yet. I’m sure eventually they will emerge, but the delay may be due to the sheer depth of Piketty’s well defended forecasts–a high bar to exceed. In his book, Piketty repeatedly makes it understood by his readers that he is venturing into the unknown, that too much reliance should not be placed on his specifics, so the above criticism is one he has already cautioned about. But, I would ask those who take this position–are you saying you never use forecasts–in business, in investing, in sports, in personal affairs…? Whether explicitly stated or simply intuitive, we are all using forecasts all the time. And, yes, they are often wrong, but often they are right, at least of a sufficient frequency and magnitude to make the end result reasonably successful. When Apple launched the iPhone, they had some kind of forecast–and if they hadn’t, we’d be pretty amazed and the Board certainly wouldn’t have approved the investment. And, the forecast was probably wrong in the end, but certainly right to a sufficient magnitude. I’d be shocked to learn those forecasts were done without the input of any economics. Most large businesses employ economists, and indeed the leaders do look to them to forecast the future, as best they can, with the usual caveats. In fact, they are hired to forecast various elements of the economy as these might affect the products and services the company is offering. Like it or not, economists do forecast. So, I discount this broad criticism and wait for those who want to provide their own forecasts and defend them half as thoroughly as Piketty has done his. Maybe the real reason to discount economists’ forecasts is that the critics don’t like the Piketty forecast. Piketty forecasts that inequality will worsen if we don’t do something about it. There are still some who think it’s either ok if it gets worse, or that natural factors will reverse it–a set of theories popularized by Simon Kuznets in the 1950s, in which Piketty (and most other economists) find no merit. The other major objection relates to policy suggestions from Piketty. These are his ideas of the very best ways to reduce inequality, to improve the nature of the world. Piketty’s first suggestion is a global tax on wealth. Detractors point out this is impractical, will never happen, politically impossible. This is tiring, because Piketty says the same thing, several times, thus there is no new insight from his critics on this point. So, why is Piketty even bothering to provide such a policy prescription if it’s virtually impossible? To me, the answer is perfectly clear. It’s because this would be the fairest and best way to solve the problem–it goes directly to the essence of the cause and arrests its growth. The primary cause of the rising forecast is that returns to capital are likely to exceed the rate of economic growth–meaning that those with wealth today can expect it to grow, and those without will be left farther behind. Any other types of measures suffer from one or more flaws of being indirect, with side effects or other consequences which are less than ideal. And, Piketty does address other measures–a critical one being assuring education of similar quality for wealthy and poor. The Economist, a conservative publication, raises both of these criticisms in the current issue (http://www.economist.com/news/leaders/21601512-thomas-pikettys-blockbuster-book-great-piece-scholarship-poor-guide-policy): The Economist wants to know why Piketty didn’t focus prescriptions on increasing the rate of economic growth, so that wealth accumulation (capital) would be exceeded by economic growth. This is entirely unfair, as Piketty devotes a huge part of the impressive work to a study of the rate of economic growth, concluding that it’s highly likely to end up well below the rate of capital growth for most of the twenty-first century. I urge The Economist to provide or direct us to an equally well done study of capital growth, with prescriptions for getting even faster growh, and especially demonstrations of how that benefits all in a fair manner. The neo-liberal suggestion to just focus on growth and that will solve all problems addresses inequality with the “trickle down” theory–sure, the rich get richer, but everyone else also gets a little richer as well. That has been the mainstream neo-liberal doctrine of the US and many other countries (China, for example) for the last 30 years, and that’s what got us to the high levels of inequality we are now experiencing. Why should we expect more of the same to resolve the problem? Roger Cohen writes about the hegemonic threat of China in his NYT op-ed on May 8 (http://www.nytimes.com/2014/05/09/opinion/cohen-chinas-monroe-doctrine.html?hp&rref=opinion&_r=0). He seems to be influenced by the views of Charles Mearsheimer, who has been prognosticating trouble for the US from China, for years now. These two are not alone in suggesting we should be worried and we should be doing something about it–right away! This kind of concern is exacerbated by news that China’s economy is now measured to be about 87 percent of the US and is expected to surpass us later this year. The primary problem with the raising of these concerns is this: The US is still clearly the strongest nation in the world, and is likely to be so for a few more decades. China is not a threat in this generation. Why? There simply is no other nation or even group of nations (bloc or alliance) which comes remotely close to US power. Global power is usually measured by looking at military power, economic strength, and soft power, the latter being the influence that a country has, based on its principles and its behavior–both at home and abroad. Fearmongers are not wrong in noting that the US has lost relative standing in all three of these since its heyday at the time of the collapse of the Soviet Union, when Charles Krauthammer declared we were the undisputed unipolar world power and Francis Fukuyama wrote The End of History and the Last Man, proclaiming that democracy and capitalism represented the final stage of evolution for the planet. Things have changed, such that these statements are no longer undisputed. 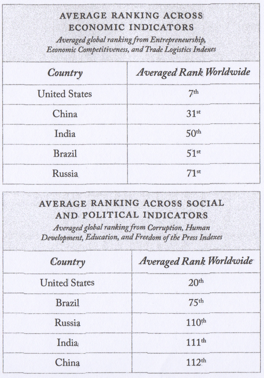 But notwithstanding the US’ relative decline since then, we are still the strongest by far. The gap has closed only to a degree, leaving us still far out in front. The gap has narrowed due both to our mismanagement of all three elements of power since 1992 (mistakes if you prefer–but all nations have made mistakes in their policies across that long period), and also the more rapid percentile economic growth of certain lesser developed countries since 1992–e.g., China, India, Brazil and others. It’s well understood that developed countries cannot grow at 10% annually, as China has, but as China grows, its rate of growth must also slow. No one disputes that. 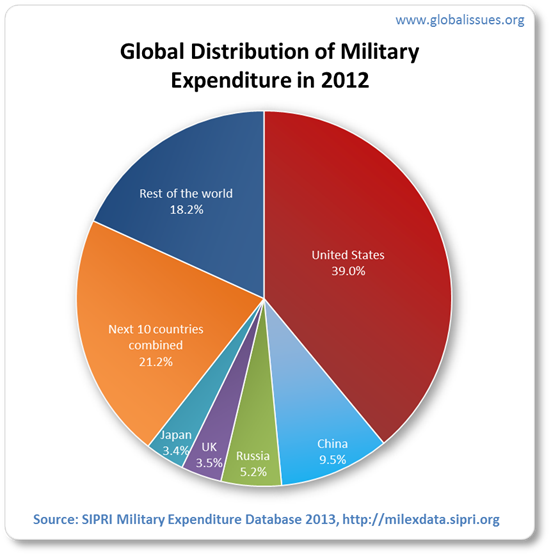 The above chart shows that the US remains a much bigger military power than China, or any combination of powers that can be imagined. The US has a formidable set of military and economic alliances which have been developed across decades, has friendly neighbors on two sides and oceans on the other two. China has little in the way of alliances and has 14 distrusting neighbors on its borders. #2 Economic power: There is legitimate dispute over what is the best measure of economic power. The 87 percent comparison is based on GDP at purchasing power parity. Many economists believe a much more relevant measure is GDP at international exchange rates, by which measure China’s economy is only 1/2 the size of the US economy. I favor a third measure–GDP per capita, PPP. On this measure, the US is at about $52,000 per person and China is less than $10,000 per person. GDP per capita is more important than raw country GDP or country GDP PPP adjusted. That’s because China has 1.3 billion citizens, while the US has 319 million. China may surpass the US this year in aggregate GDP, but China has a multitude of internal needs for spending before that economic power can be directed to all the political and military costs that would enable it to be a contender with the US for ranking leadership of the world. These include raising the standard of living for all in China, bringing more than 300 million more out of poverty, the polluted environment, building cities, and a host of other problems and needs for money to be spent. Source: Brzezinski, Zbigniew. 2012. Strategic Vision: America and the Crisis of Global Power. New York: Basic Books, p 52. Also, remember that trends are not usually long lasting. How many people know that China’s economy was the largest in the world in 1890? That did not sustain. Similarly, our weakness in military campaigns and particularly in (mis) managing our economy may have reached its low point around 2008/9 when we were still fighting two unfortunate wars, our economy seemed on the precipice of collapsing, and China’s success with a benevolent dictatorship seemed to offer some notable benefits over a gridlocked American congress. However, since then, our economy has rebounded nicely and there have been plenty of soft power issues on the negative side of the ledger in China–e.g., human rights, intellectual property, environment, legal system, as well as concerns about an investment driven economy. 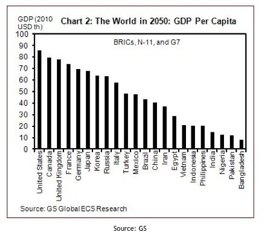 China’s growth to even the level Goldman Sachs predicts by 2050 is by no means assured. I would argue that the risks faced by China across that period are greater even than those faced by the US–in terms of sustainable development. So, while we should not rule out the possibility that China will rule or lead the world someday (as the US has done for decades), that opportunity appears to be at least 30 years away, if it occurs at all. There is time for India or Japan or others to take stronger roles across such a long time, or (my hope) that international governance will further develop to manage the problems of the world in collaboration. That’s where we should put the priority of our efforts during whatever time we have remaining in leadership. Mearsheimer has argued that the US should take actions now to slow the growth of China’s strengths–economically, for example. We should create obstacles to Chinese success. I disagree. We should work cooperatively with China to best enable the successful economic growth of both countries, and for the most part, this is what we have been doing, notwithstanding Mitt Romney and Donald Trump. I’ll go with Avery Goldstein who argues that China needs and wants the time to solve its problems and develop, under the protection of US unipolarity, and with Lee Kuan Yew who says Chinese leaders themselves estimate that they need 30-50 years to prepare themselves for a leadership role in the world. Right now, they just want a deserved seat at the table. Some might interpret my recent posts as suggesting a preference for government solutions. I’m equally happy with private solutions. Corporate pay, especially for CEO’s, is a good example. The Board of Directors and the shareholders are certainly the ideal bodies for determining appropriate CEO pay. However, the excesses under current practices have become so egregious that Directors should rightfully fear the government will step in, if they don’t do their jobs. There have been referenda in certain countries to limit the pay of CEO’s. The US has a higher ratio of CEO pay to median employee pay than almost any other country, and government controls could happen here. Davidoff reports her base is $1 million. That’s OK. Her bonus is a minimum of $2 million, subject to meeting goals. That’s OK, too. So, how is it that her compensation at the end of 2013 is estimated at $214 million? That’s not OK. That kind of compensation is way over the top, excessive, unnecessary to motivate or compensate any executive, and it is dilutive to the shareholder equity in the company. It adds to the ire of those concerned with inequality, the advantage of the 1%, and the lost decades to the working class. Davidoff lays out a mixed record for her two years at Yahoo–revenue was down in 2013 and profits were down in the first quarter of 2014. She has made some promising changes, but it is too early to see how her term at Yahoo will add up. What’s driving the big bucks is stock options. When Compensation Committees of Boards were faced with challenges over corporate pay, they gradually figured that putting the bulk of potential pay on stock performance was an easy way out of criticism: A CEO would only get the $1 million base and the $2 million bonus if the stock value didn’t go up, and if it did, the CEO would only get a piece of the increase in market value? Either way, the market determined the final amount, not the Board. Sound fair on the surface? Results can’t be blamed on the Board, they figured. But what if the CEO had little to do with the appreciation in the stock value, as may well be the case with Mayer. She may turn out to be a fabulous CEO, but it’s too early to know that, based on mixed results across the two years. Yet, the stock of Yahoo has appreciated dramatically, primarily as a result of the stunning promise of Alibaba, a privately owned internet giant in China in which Yahoo holds a minority interest, and which may go public soon. Mayer did not negotiate that deal and has little, if anything, to do with the performance of Alibaba. OK, this case is unusual, due to the unique driver of the stock price. But, there could easily have been a way around that, if the Board had done its job. Any there are many other examples of such stock option driven excesses, without an Alibaba in the mix. I vote (again) for asking the private sector to do its job–for example, the Board should go back to making discretionary decisions on CEO performance and compensation–take the responsibility back that your role requires. Give Mayer $10 million if you think it right, but not $214 million! Don’t sidestep your responsibility, and don’t complain if you do, when the government or the public step in and compel limits. Capitalism can work well for our society, but some elements of greed do need to be constrained by the private sector, or the public sector can and will rightfully do that for them.